The flat surface produced by a cutting wheel that has a flat profile is known as a facet. However, when the flat surface is elongated, the result is often called a flute or a panel. This is the case for the goblet illustrated here. The swelling beneath the bowl, a knop, has been faceted with small cuts while the remainer of the stem has been cut with six elongated facets. The stem, incidentally, contains an air trap through-out its length. If this stem lacked a knop and were cut in elongated facets, it likely would be called, logically, a flat cut stem. 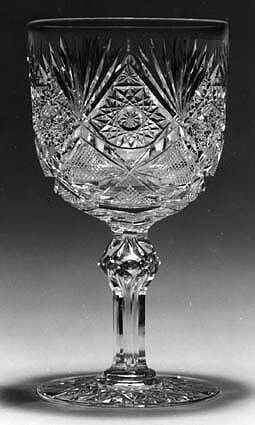 While such stems occur on brilliant-period cut glass, the resulting prisms — the intersections of the adjoining facets — usually are finely notched, especially on domestic stemware. In examining this goblet notice how the thickness of the blank determines the depth of cutting and influences the pattern’s design: The deep miter cuts near the base of the goblet’s bowl are in marked contrast to the shallower cuts farther up the bowl. There is a 16-pt hobstar on the goblet’s foot. Its pattern and manufacturer are thus-far unknown. H = 5.75″ (14.6 cm), rim D = 3.1″ (7.9 cm). A set of six goblets sold for $525 in 1982.